The HAI Omni Console with Built-in Speaker/Microphone is a surface mount console with a slim design that can be flush mounted with an optional flush mount backbox. The Omni Console is compatible with HAI's Omni LT, Omni, Omni II, Omni IIe, OmniPro, and OmniPro II Home Control Systems. This version of the Omni Console has a built-in speaker/microphone. For the speaker and microphone to work you must install a Two-Way Voice Module (HAI Part Number 10A11-1) in your home control system. 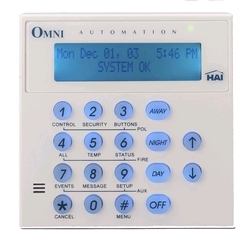 Every Omni family home control system is required to use one of these Omni Console with Built-in Speaker/Microphone or an Omni Console (HAI Part Number 33A00-1). It features a 48 character cool blue backlight LCD display with menu operation, backlit keys, selectable keyclick, beeper functions and viewing angle. A two-color LED offers status at a glance: red for security armed, green when disarmed. All control, security and programming functions can be accomplished using a console. It has Silk Screen with the menu options printed on the console face.